Teaching your child to read is easy, but you can mess it up. There are a few important things you will need to know. The first rule of thumb is the most important: make sure your child (let's call him "Johnny") is developmentally ready. • Is Johnny able to sit still in a chair for 10–20 minutes? • Are his eyes able to track the words properly? • Are the right and left sides of Johnny's brain in communication with one another (a prerequisite for true reading)? If you're unsure, then please read my blog post Five Signs Your Child Is Not Ready to Read for further direction. If Johnny is ready, proceed with caution. Teaching Johnny to read is arguably the most important skill you will teach. You have to know the right time to teach, the right way to teach and the right method to teach. If you don't get the reading part right, and consequently raise a child who dislikes reading, many doors will be shut for Johnny. As evidence shows, homeschooling is no guarantee of success. I've talked to homeschooling parents whose children don't enjoy reading because of simple mistakes that were easy to avoid. In my world, this is a tragedy and I'm guessing, if you're reading this, it is in yours, too. Another word of caution: you do not want to use the "whole" word approach and you don't want to use fancy, useless phonics programs that are overpriced and inefficient. The whole word approach is when a child is taught to memorize the way a word looks without an understanding of phonics. Later, though, when he encounters more difficult words, he cannot keep up and is labeled a "poor" reader; yet, without having had an understanding of phonics, he was never a "true" reader to begin with. Assuming Johnny is developmentally ready, we can move on to phonics. Using the phonics method is the only effective way to teach a child to read. If anyone tells you anything different, don't listen to them! 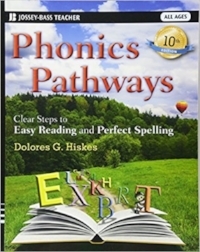 My "go-to" phonics book is Phonics Pathways by Dolores G. Hiskes. Dolores lives in the next town over from mine. Years ago I had the opportunity to meet her, and we chatted about her book. First of all, it's based on a sound understanding of how children learn to read, and it works. It's a no-frills program that will give Johnny just what he needs and sometimes a little more (feel free to skip sections that become too repetitive). Best of all, it's inexpensive. The cost of books adds up (I know mine does), and I'm sure you'll agree, it's more useful to spend money on quality hardback classic novels—books Johnny can take pride in owning and enjoy reading for years—than fancy phonics programs which may be more confusing than efficient, and most certainly expensive. You may find what I'm about to say now surprising, but it's true that you don't actually have to teach Johnny the alphabet, first. In his classic book Why Johnny Can't Read Rudolph Flesch suggests we move right into short vowels and some consonants. That's a bit of a jump for me—though it makes perfect sense—and it may be for you, too, so I'm going to suggest we do start by teaching Johnny the alphabet. Employ the alphabet song to help Johnny memorize the alphabet. You will also teach him the sounds each consonant makes. Use flashcards to help Johnny learn to recognize the letters; he absolutely must be able to recognize them out of sequence, too. Here is a link to the traditional alphabet song for you to learn the tune (not for Johnny to watch): https://www.youtube.com/watch?v=yseWMJS8IHw. You can make your own flashcards or buy a box already made. Here's a link to my favorite flashcards: http://amzn.to/2AnbRlM. Opening the phonics book, we will teach Johnny the short vowel sounds so well that he will immediately be able to recognize the difference, for example, between a short "e" and a short "a." Work with him until he does, but without overdoing it until poor Johnny wants to pull his hair out. You get my point. You can also move on and let Johnny become more familiar with the short vowels as he practices. It's your call, but it's easier if Johnny can get the short vowel sounds down first. Usually a child who's ripe for learning to read will have no problem tackling this. Johnny will then begin to put a vowel and a consonant sound together. This is the second step in learning to read. Don't rush it! If Johnny is making mistakes with the vowel sounds, go back and do a few practice drills. Whatever you do, as long as he is paying attention and trying hard, don't get frustrated with him. He is smart. It's just that intellectual openings come in their own time, and while his could be tomorrow, it may not be today. Pay attention! 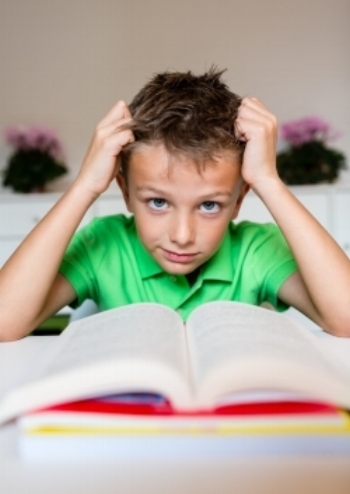 Learning to read requires a lot of mental effort. Notice when Johnny starts to make mistakes, not because of poor understanding, but because he's tired. This is when you retire the phonics book for the day. Time is irrelevant. Some days, in the beginning, Johnny may do a whole page, some days even two full pages; let him go at his own pace while challenging him, but also paying attention to when he's really had enough. The goal is for learning to be challenging, but not overwhelming to the point of despair. Learning to read should be a pleasant and rewarding experience. Next, comes the big moment. When Johnny gets to the three-letter-word page, this is the day you've been waiting for. He will easily be able to sound the first word out and voila! Johnny's read his first word. It's that simple. You will continue with the lessons and by the time Johnny gets to the five-and six-letter words, he should be ready for his first reading book. 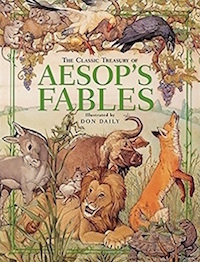 Maybe a copy of Aesop's Fables? Learning to read, as we know, is a major milestone in a child's life. Johnny is leaving behind his world of relying on people to read to him, to become an independent reader. You will still read great books to Johnny, hopefully, for years, and he can even read to you, but he is now firmly on his way to reading solo. "Marks [rewards] of any sort, even for conduct, distract the attention of children from their proper work, which is in itself interesting enough to secure good behavior as well as attention." Need I say, she was not a promoter of grades or rewards. If I were to do it again, however, I would have packed each of my children into our family car and taken them to our local bookstore, where they would have picked out their first reading book. A book they could read whenever they chose to do so. I would do this to mark the day they learned to read, and the day I taught them, forever in their memories. As it stands, neither of my children remembers this day, and I only remember the day I taught my son. But you can do this differently. Keep in mind, however, that Charlotte Mason may not approve. Let's face it, as homeschoolers, it's a huge milestone for us, too. The day our children learn to read is the day we realize, with the right understanding, we can do this thing called "homeschooling." It really isn't rocket science, after all. I'd love to know whether or not you had any struggles teaching your children to read and how you overcame them. You're invited to take advantage of Elizabeth's Free 15-Minute Consultation for new clients by clicking on the "Let's Get Started" box.